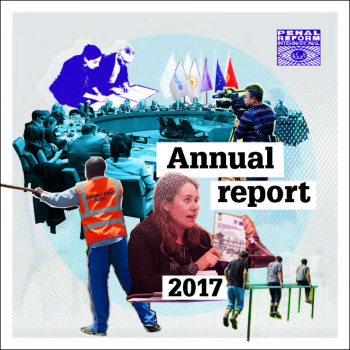 PRI has published its latest annual report, which outlines the impact of our work and achievements from 2017. The report, which includes messages from PRI’s Executive Director Alison Hannah and PRI’s Chair Dirk van Zyl Smit, showcases the work of PRI’s regional offices as well as our international advocacy work, and explores the impact of our publications and resources. Publication of Global Prison Trends 2017 – the third in our annual flagship series – which highlighted the links between criminal justice and the Sustainable Development Goals. Our Middle East and North Africa office’s continuing delivery of a penitentiary reform programme in Yemen, despite the war. The first project delivered by our Africa office, based in Uganda, providing training to prison officers on vulnerable groups of prisoners. Successful completion of our Kenya project to develop gender-sensitive pre-sentence reports for the court and community service placements for women offenders. Our Central Asia office’s new initiatives for human rights advocacy in Uzbekistan and combatting corruption in places of detention in Kazakhstan. Our project in Georgia providing skills training and counselling services for women who had experienced abuse and violence – factors linked to their offending behaviour. Developing a new project for demilitarisation of the prison service in the Central African Republic. Gaining and disseminating expertise in the management of violent extremist and radicalised prisoners.